Bert de Vries is a professor of history and archaeology at Calvin College in Michigan and the director of the Umm el-Jimal Project in northern Jordan. This collaborative project unites a number of key partners – including Open Hand Studios, the Jordanian Department of Antiquities, faculty from Yarmouk University, and, most importantly, local residents near the site – around the shared goals of cultural preservation and sustainable development. 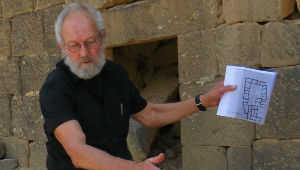 Archaeologist Bert de Vries is the director of the Umm el-Jimal Project in northern Jordan. Bert oversees site preservation projects in the ancient city, including one supported by the U.S. Ambassadors Fund for Cultural Preservation to preserve the ruins of a large residential complex built between the 5th and 6th centuries A.D. Phase I of the project was completed in January 2013, and AFCP recently awarded Bert’s group a grant to continue with Phase II. A project of this scale, involving heavy blocks of basalt, fragile ruins, and dangerous site conditions, presented some major preservation challenges. Telling the story of this ancient city is equally challenging, especially since its history spans several centuries and cultures and its ancient buildings and roads lie in ruins or buried under layers of debris. The work Bert and his team completed in January 2013 was one of several milestones in the modern history of the Umm el-Jimal site, where archaeologists have been working since the early 20th century. Although not as well known as the Jordanian sites of Petra and Jerash, Umm al-Jimal spans several important periods in the history of the Middle East from the 1st to the 20th century, including the ancient Nabataean, Roman, Byzantine, and Islamic periods, all of which predate the establishment of the modern Hashemite Kingdom of Jordan in 1949.